Put all ingredients in food processor. Blend until smooth and creamy. For a ‘Nutella-like’ spread, place in sealed dish and refrigerate. 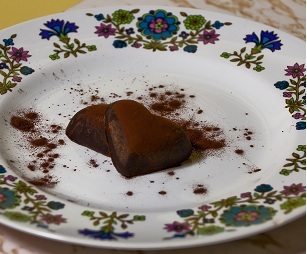 For a truffle-like chocolate, place in ice cube tray and keep in freezer. Do not let defrost for long before serving. Love this dessert & make it all of the time! I substitute almond butter for raw cashini butter to make it extra creamy. Love making a good sized batch as a spread for the fridge and throwing a few in the freezer when I am in the mood for truffle like chocolates. The only problem is not eating the whole thing! S - I like your additions/substitutions. I have even made it with sesame butter for when I am making it in my cooking classes with kids (no nuts). I have also switched the cocoa for carob to avoid caffeine. I too keep a batch in the freezer for those sudden cravings but yes, having just one is nearly impossible;) Thanks for your comment! APHRODISIACS, Need I Say More? Is Kombucha a Wonder Drink or Foodie Fad?